Croisières Évasion Plus, located in Lachine Montreal, Quebec, offers a great entertainment with various types of boat cruises. Departures are made from Lachine pleasure boat harbour in the area of Montreal, Quebec. Our unique cruising boat will enchant you and will show you a unique panorama on the St Louis lake and the Canal Lachine on south west of Montreal. Departure from Lachine, Hot and cold dinner buffet, bar service ($), dance with DJ and animation, duration of 4 hours (from 19h00 to 23h00), on reservations only. Six to seven cruises per week. 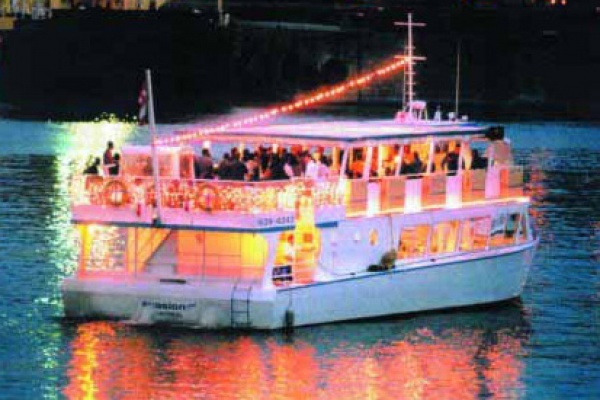 Departure from Montreal Old Port, four course dinner, bar service ($), dance with DJ and animation, Loto Quebec fireworks with live music of the fireworks, duration of 4 hours (from 19h00 to 23h15), on reservations only. See Loto Quebec firework schedule. Total of ten firework cruises. Aboard a spectacular catamaran, capacity 300 passengers. Departures from Quai Jacques Cartier in Montreal Old Port at 07:30 arrival in Quebec City Old Port (Bassin Louise) at 14:00, brakfast and lunch included. Return the next day from Quebec City. Departure at 14:00, arrival in Montreal at 21:00, snack and hot dinner included. Lodging in Quebec city not included and available on request. Period of validity of gift certificates: Period of use from mid-may to mid-october.